Eric Prieur, Director of Cold Chain Sustainability at Carrier Corporation, died tragically on the ill-fated Ethiopian Air flight 302, en-route to Nairobi for the United Nations Environment Assembly Conference. Prieur was to make a presentation on behalf of the Food Cold Chain Council on food loss and waste. He had great energy and passion on the topic of sustainability and increased Carrier’s level of participation and leadership on a global scale. AHRI offers its deepest condolences to his colleagues, friends, and family. Contact: Francis Dietz. On Monday, March 11, AHRI switched to a new help request ticketing system, hosted by FreshDesk, to support AHRI Directory, ACS, and iSTARS users, and data subscribers. This ticketing system replaced DirectoryChanges@ahrinet.org and acctdirsubs@ahrinet.org, which are no longer accepting emails or new ticket requests. New help request tickets can be created via the "Request Assistance" button that now appears at the top of each AHRI Directory, ACS, and iSTARS page. Manufacturers should inform their customers that this button is the most effective way for them to receive direct assistance from AHRI. All open and in-progress DirectoryChanges tickets at the time of the switchover were migrated to the FreshDesk ticketing system, and users received an email with the new ticket number generated by the FreshDesk system. Contact: Alison Andrews. 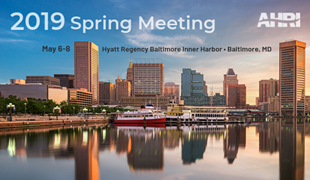 AHRI members are invited to join staff and industry colleagues at the 2019 AHRI Spring Meeting, taking place May 6-8, in Baltimore, Md. This will be our first membership-wide event under the new Reinvent structure approved by the Board of Directors in November 2018. In addition to Working Group, Sector Council, and Standing Committee meetings, the Spring Meeting offers plenty of opportunity to network with your industry colleagues from across the country. Register today to meet them in Baltimore this May. Contact: Lauren Miller. 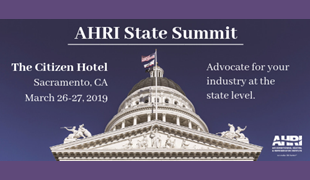 The AHRI State Summit, to be held March 26-27 in Sacramento, will include a meeting with Che Salinas, Chief Deputy Legislative Affairs Secretary for Operations in California Governor Gavin Newsom's cabinet. This two-day event provides an opportunity for AHRI members to communicate directly with key California policy makers, and hear from other stakeholders about the policies most important to the manufacturing community. Register for this event here before the March 20 deadline. Contact: Beth Teferi. 1st Public Review of BSR/ASHRAE Addenda f, g and h to ANSI/ASHRAE Standard 90.4-2016, Energy Standard for Data Centers. 1st Public Review of BSR/ASHRAE/ICC/USGBC/IES Addenda q, r, s, t, u, v, w, x and y to ANSI/ ASHRAE/ICC/USGBC/IES 189.1-2017, Standard for the Design of High Performance Green Buildings Except Low-Rise Residential Buildings. 5th ISC Public Review of ASHRAE Guideline 27P, Measurement Procedures for Gaseous Contaminants in Commercial Buildings. 1st Public Review of BSR/ASHRAE/ICC/USGBC/IES Addenda o, p, z and aa to ANSI/ASHRAE/ICC/USGBC/IES 189.1-2017, Standard for the Design of High Performance Green Buildings Except Low-Rise Residential Buildings. To view details, refer to the recent issue of ASHRAE’s Standards Action. Access the Public Review Drafts by visiting ASHRAE’s Standards, Research, & Technology/Public Review Drafts web page, and following the instructions to access the online comment database. All necessary membership forms are available here. Contact: Cesar Eizaga Colmenares. Consolidated airflow and static pressure language into one central section. Expanded definitions to include ICM and OUM. Added language to provide a hierarchy of decisions when testing issues arise. Removed corrections for barometric pressure. Added capacity corrections when additional line length is used in testing. Added language to clarify refrigerant charge requirements. Harmonized operating conditions with AHRI 210/240, and included makeup water for evaporative cooled equipment. Added new provisions for testing units with no filters. Incorporated test tolerances from ASHRAE 37 with new additions for voltage and dew point measurements. Added procedures to Appendix C and Appendix E.
Updated Appendix D, Unit configuration, from informative to normative. On March 8, AHRI International Affairs Analyst Nick Harbeck participated in a Trade Forum hosted by the National Association of Manufacturers (NAM), featuring Mike Dankler, Chief of Staff for Rep. Jackie Walorski (R- IN). Attendees discussed Section 301 tariffs on Chinese products, Section 232 tariffs on steel and aluminum and automobiles and automobile components, World Trade Organization (WTO) reform, the United States-Mexico-Canada Agreement (USMCA), the U.S.’s intention to remove India and Turkey from the Generalized System of Preferences (GSP), and upcoming Free Trade Agreements with the EU, the UK, and Japan. Rep. Walorski, a member of the House Committee on Ways and Means, recently introduced HR 1452, a bipartisan bill that would require the Office of the United States Trade Representative (USTR) to establish an exclusion process for products affected by the third round of Section 301 tariffs. Dankler publishes a weekly trade newsletter, which is a helpful resource used by AHRI staff to update AHRI’s members-only Tariff Tracker. AHRI members can subscribe to the newsletter here. Contact: Michael LaGiglia. On March 11, AHRI sent comments to the House Committee on Ways and Means in response to a February 27 hearing notice on U.S.-China Trade. United States Trade Representative Robert Lighthizer was the sole witness at the hearing, a recording of which can be found here. AHRI opposes the Section 301 tariffs on Chinese products and the resulting retaliatory tariffs, which it views as a tax and disruption to the HVACR and water heating industry. An April 2018 survey of the AHRI membership found that a majority of members expected to be adversely affected by tariffs on Chinese products. These concerns were confirmed in a second survey on the subject, conducted in January 2019, which found that a majority of members were in fact negatively affected by the Section 301 tariffs on Chinese products, and supported removing the tariffs. Please see AHRI’s members-only Tariff Tracker for more information on the Section 301 tariffs. Contact: Michael LaGiglia. To ensure delivery, please add 'mmreturn@magnetdev.com' to your email address book or Safe Sender List.